This entry was tagged colonialism, graphs, R. Bookmark the permalink. ← I Say Tomato, You Say… Apple of Paradise? I liked the post. In fact, I liked it so much, that I thought I’d take a crack at reproducing your graphic in Tableau. It took me a couple of hours to complete because I had to do a lot of detailed things like data reshaping, picking and setting custom colors, and studying your design elements. 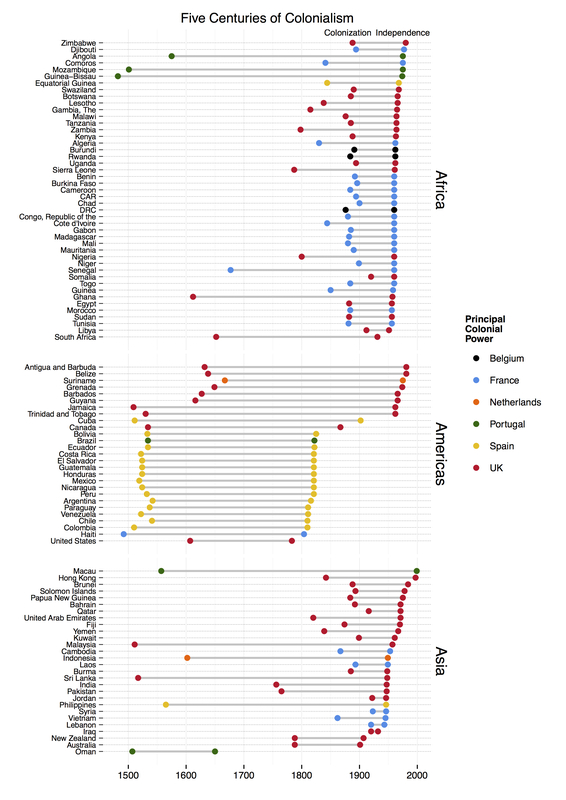 I produced two charts – one sorted like you did by when the countries gained their independence. I also did one sorted on when they colonized. I thought that was an interesting way to look at the data. If you are interested in seeing these renditions, just let me know. Thanks for sharing! Hey, that looks great! I like the sorting by date of colonization rather than date of independence. I like this post and I like that it is easy to read. My first thought was wouldn’t it be interesting to see this data along side the economic development of each of the countries on the chart? When did the economic development of Uganda peak, for example. During its colonial period or after? Why might that be? etc. I am in no way suggesting that you do this. I know that I don’t have that kind of time and I don’t know who would want to punish themselves in that way, but it would be interesting to see and it might open other roads of inquiry. Ken, I love the new lens your plot creates. It makes it easy to pick out surprises (to me), like the 2 countries outside of the Americas that Spain colonized (Equatorial Guinea??? ), and how much older some of the colonies were than others close by (The UK in Jamaica, for instance.) Also Portugal’s early and long hold on its colonies really stands out. Oh yeah, and who knew that Portugal colonized Oman? Thanks for you feedback, Sue. Glad you liked it!